PRETTY GOOD SOLITAIRE for iPad - 30% Off This Weekend Only! Pretty Good Solitaire for iPad is on sale this weekend only - get our 520 game collection of solitaire games for iPad for 30% off! Starting today, Friday January 17th thru Tuesday January 21st , get Pretty Good Solitaire for only $6.99 instead of the regular $9.99 price. http://www.goodsol.com/ipad/pretty-good-solitaire.html for the full list of games. 1) The game name and game number at the top center is a button. From this button, you can restart the current game, start a new game, select a game number and play that, or see your statistics. 2) Furthermore, on game history list of your games played, if you swipe on a score, a button will appear that allows you to delete that score. Also, in the iPad app if you play a game number you have played before, it will replace your old score with your new score. 3) If you touch a card and hold your finger on it, the app will show you the building rules for that pile, plus how many cards are in the pile. 4) You can change players by typing a player name in the player name box on the main screen. 5) You can select a game to play at random by shaking the iPad when at the main screen. 6) You can add a game to Favorites by touching the star next to the game name in the menu. Or, to remove a game from Favorites (a game that is starred), just touch the star again to unselect it. 7) Shaking the iPad while in a game undos a move. 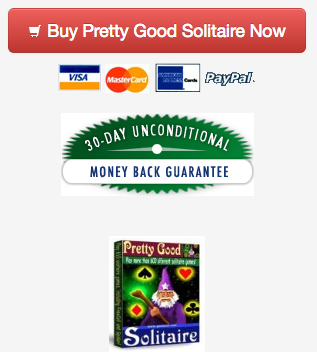 With a new year comes a change in the free upgrade period if you purchase Pretty Good Solitaire. Last year, if you purchased Pretty Good Solitaire (Windows) during 2013 we promised free upgrades through 2015, now for new purchases in 2014 the free upgrade period is until the end of 2017. This applies also to upgrades from previous versions at http://www.goodsol.com/upgrades.html . New upgrades from previous versions are also good through 2017 now as well. Currently all purchases or upgrades made after April 12, 2011 are still in their free upgrade period. New versions for these purchases can be downloaded from http://www.goodsol.com/download.html . 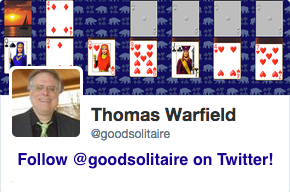 If you purchased Pretty Good Solitaire before that date and have not yet upgraded, you can upgrade at http://www.goodsol.com/upgrade.html , or remember that you can always download older versions from http://www.goodsol.com/downloadpre.html (at least one of the versions there will be a free update). Updates of the Mac version are still currently free and the latest version can be downloaded from the link in your receipt email. Also, iPad updates are free (Apple does not yet have a paid upgrade system in the AppStore) and iPad purchases can always be downloaded from the Purchased area of the AppStore on an iPad. This game is at Martha.